The winning team from Bishop Shanahan High School poses with their coach after the Chester County Governor’s PA STEM Competition award ceremony. Chester County high school students skilled in science, technology, engineering and math competed in this year’s regional Governor’s STEM competition on Tuesday, February 6 at the Chester County Intermediate Unit. 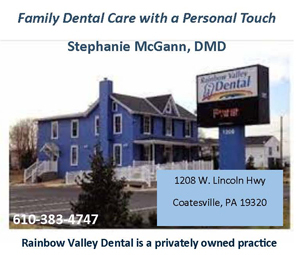 Participating teams included Bishop Shanahan High School, Coatesville Area Senior High School, Oxford Area High School and Technical College High School Pickering Campus. This year, Bishop Shanahan High School finished on top, with Oxford Area High School coming in a close second and Coatesville Area Senior High School securing third. The title of the winning proposal was “DOORA.” The project was created to automatically open doors in response to a fire, allowing firefighters the ability to enter the building more quickly. The team was inspired to invent DOORA after the November 2017 five-alarm blaze at the Barclay Friends Nursing Home in West Chester, PA. “We saw just how quickly that fire spread throughout the building. In the event of a fire, even the smallest amount of time can make a life-saving difference,” teammate Brendan Manning explained. During the weeks of preparation for the competition, which aims to help students further their knowledge of STEM concepts, students collaborated with mentors from local companies to educate themselves about STEM careers and to aid them in their research and application. The students then presented their prototype and findings to a panel of judges who graded the presentations based on a statewide rubric. 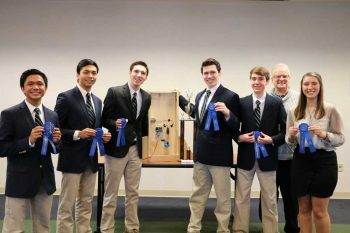 As the Chester County winners, the Bishop Shanahan High School students will advance to the state competition with an additional $750 stipend to improve their prototype.